(a) Calculate the currents i1, i2 and i3 immediately after closing the switch S (when t = 0). 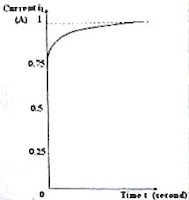 (b) Steady state is reached when t = ∞. In this condition, the current is controlled by the resistances only [since dI/dt is zero and no opposing induced voltage L(dI/dt) is developed across the inductance]. The circuit then behaves as made of the parallel combination of R2 and R3 (having effective value of 4 Ω) in series with the battery and the resistance R1. The effective resistance of the circuit is (8 + 4) Ω = 12 Ω and the current delivered by the battery (i1) is (12 V)/ (12 Ω) = 1 A. Since this current is equally divided between the two parallel branches, current through each branch is 0.5 A. So, i2 = i3 = 0.5 A. (c) The variation of the current i1 with time t is shown in the adjoining graph. [The current grows exponentially in the inductive branch and this is why the current delivered by the battery finally rises to the steady value of 1 A as shown]. (d) The slope of the graph when t = o is infinity since the current grows abruptly to 0.75 A because of the purely resistive parallel branch containing R3. The slope when t = ∞ is zero since the current has settled to the final steady value. 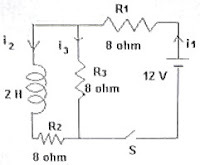 (e) When R3 is disconnected, We have a series LR circuit with L = 2 H and R = R1 + R2 = 16 Ω. The time constant of the circuit is L/R = 2/16 = 0.125 s. The current grows to 63.2 % of the final steady current within this time.